Jeremy A 150-mile round trip to London and back today should have been enough time to get to know somebody. Sat at my desk again this evening, I still don’t feel I truly know the Cascada. On the one hand, it looks like a pretty car, with an interior that’s roomy enough for four and very well equipped for the money. On the other, it’s heavy, soulless and with the 1.4 petrol engine under the bonnet, rather slow to get up and running. If you are considering a Cascada – or an Audi A4 Cabriolet, BMW 3 Series etc – then for heaven’s sake, make sure you test drive the forthcoming 195bhp 2.0 biturbo diesel version because I imagine it will provide the extra grunt this Vauxhall needs. Overtaking in the 1.4 requires a lot of ‘winding up’ first. Drop down to third, find a long, straight stretch of road and cross your fingers. It’s just not an engine suited to this car. Jeremy There were three, perfectly placed ashtrays in my 1972 Alfa Romeo GT Junior – two in the back and one in the rear. The most memorable, fold-out cupholder of all time was in the Saab 9-3, it just glided out and open with a brush of the index finger. 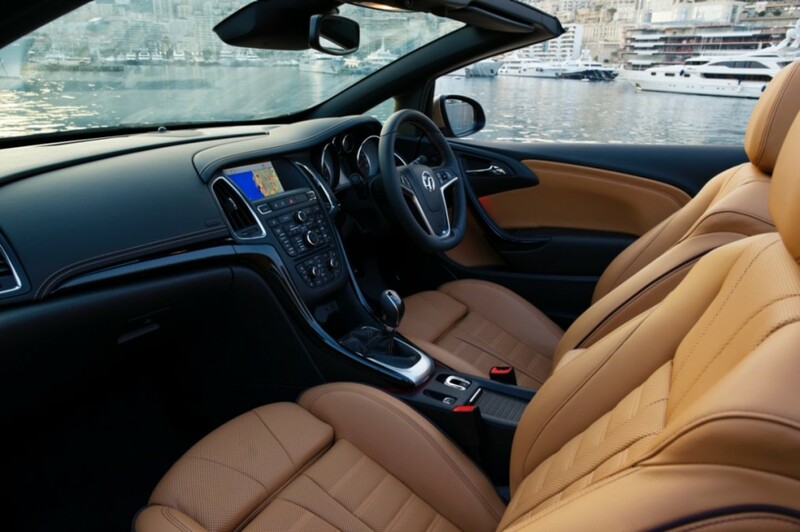 There are two cupholders in the Vauxhall Cascada. I’m not a a big fan of Starbucks or Costa but they are probably the biggest suppliers of take-away coffee in Britain. If I was designing a centre console for a new car, I would probably take two coffee cups from Starbucks/Costa/both and make sure they fitted. They don’t in the Cascada. You can squeeze one in but add another cup and there is an unfortunate clash of lids. Frustrating isn’t the word. Don’t try holding one between your legs, just open the cubbyhole box and it should slot in nicely. This isn’t what the cubby box was designed for I think. Next time, Jessica and I will just have to share a latte. Saturday – Style & Substance? Jeremy The Cascada is turning headings in Cornwall. Today we were picking up a mammoth supply of pasties from the village Post Office and received admiring glances from tractor drivers and caravan owners alike. I’m going to side with them. The ‘stubby bonnet-high boot’ look works on Vauxhall’s four-seater cabriolet. The rear end, in particular, has an uncluttered and rather chic appeal. A good deal of style for your £24,000 – but is there any substance? As pretty as the Cascada is, the 1.4 suffers from being woefully underpowered. To achieve any kind of performance, you have to work the gearbox very hard indeed, straining the engine and reducing everyday performance down to around 37mpg max. Changing gear through the six-speed manual transmission is also a tiresome ordeal. There’s nothing sporty about the experience, with a long throw gearstick and rather clunky changes in first, second and third. Ouch. On a positive note, the Cascada is quiet at motorway speeds despite the canvass hood and comfortable. You can genuinely fit two adults in the back seats too, although headroom is a little claustrophobic. Maybe we should be testing the more powerful 2.0 diesel? 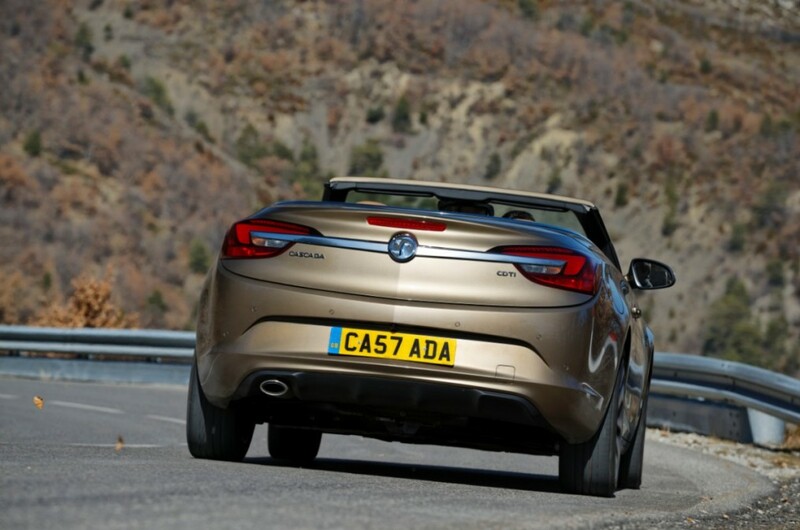 Vauxhall has announced new engines for the Cascada this week. I would strongly suggest you wait and purchase one of them – unless you buy a car on looks alone? Jeremy It’s not as a bad as beating your dog or eating a McDonald’s but I’m going to admit to road rage. Actually, it wasn’t so much road rage as ‘driveway‘ rage. I’m 50 years old and I should be over it but the Cascada got the better of me today. Jessica and I were rushing to get on the road to Cornwall. 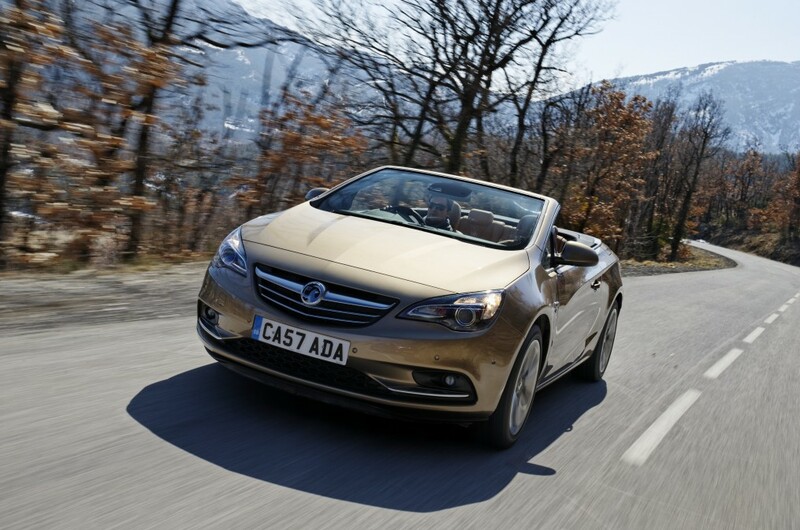 The Cascada has a soft-top roof which folds into the boot and eats up on space when it is hidden away. For the mechanism to work, an internal boot liner has to be in place to ensure there is enough room for the roof to fit in. This means you lose a large chunk of luggage area (100 litres out of 380 litres) but I packed what I could underneath the liner and threw the rest of our kit on the back seat. They it all went wrong when I pressed the one-touch button – and the roof refused to budge. With my blood pressure soaring I checked the boot. Everything was in place so why wouldn’t it fold down? Then I had to find the right part of the manual to see what the problem might be. Manuals aren’t what they use to be, they are complicated and designed for the whole range of Cascadas, not just your model. When this failed I went back to the boot and ripped all my luggage out, tossing it across the driveway. After repacked again, it worked. I still have no idea what the problem was but the effect was similar to a wasp sting. The bigger point here is why does a folding soft-top have to fold into the boot? A folding hard-top needs the extra storage space for all that metal but if a tiny Mazda MX-5 can store a convertible top without touching boot space, why can’t a Vauxhall Cascada? Jeremy I’ve always towed boats but this is the Cotswolds in Gloucestershire and that means horseboxes. The ‘Glossy Possy’ who live here aren’t short of a bob or two and you are judged by the size of your horsebox – just like actors always want the biggest Winnebago mobile home on location. There are no ponies grazing on our lawn but Jessica has owned a few in her time. Her grandfather, Jack, was the youngest member of the British equestrian team at the Berlin Olympics in 1936! Mitsubishi UK are based just up the road in Cirencester, so hard-working Shoguns and L200’s are as common as muck with the equine set. 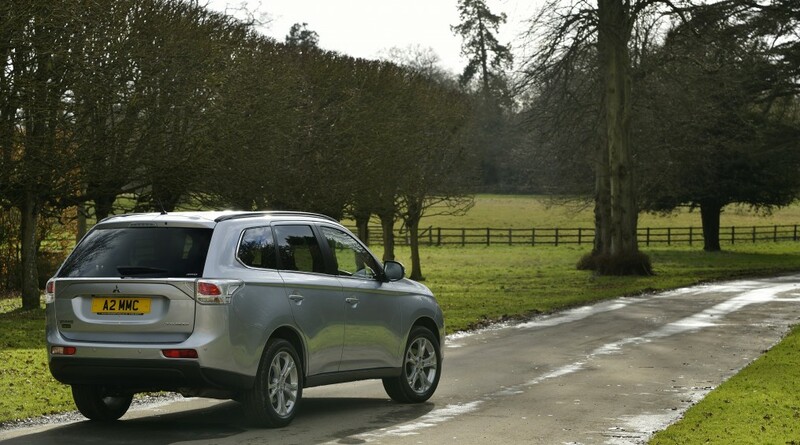 But they shouldn’t rule out the Outlander, mainly because it has an impressive tow weight of two tons – more than many key rivals. And with just the front two rows of seats in place, the boot space is massive. Plenty big enough for two or three large dogs, although if you pull out the two third row seats at the rear, luggage capacity is severely limited. Jeremy If I had to choose a small SUV on style alone, then the Kia Sportage would be top choice. The Honda CR-V now has the blandest backside in motoring history and I wasn’t too sure about the Outlander when it arrived either. Then something happened. I took ten paces backwards and suddenly the Mitsubishi became a vehicle transformed. It’s as dull as a block of butter close up but this is a vehicle that needs a little space to be appreciated. The slippery shape isn’t that different to many an SUV on the market but the new Outlander nose gives it something extra. It looks especially good with privacy glass too. So it’s a shame the interior is less impressive. The centre console housing the automatic gearstick looks like it could have come from a Mitsubishi utility vehicle and is totally out of place in a £34k family car. 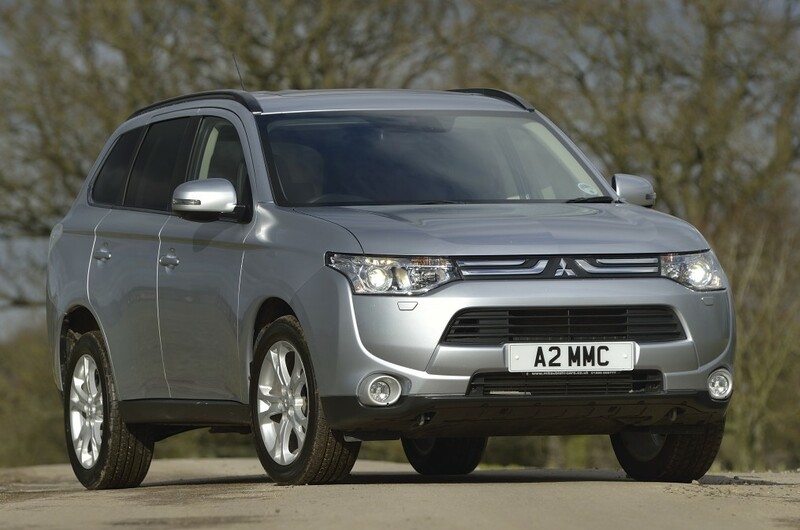 Mitsubishi need to look at a Land Rover Freelander. Fixtures and fittings are important and the Outlander lacks the finish to put it in this price bracket.